hope my partner likes this. Found the prettiest little baby lace dress in the second hand store, cut it up and mod podged it to the jar to get my lace effect. Looked at my beautiful creation that Bobbie made for me. I really miss her. What pretty pins, and a lovely gallery. I was compelled to view Bobbie's gallery after reading a post by ILOVEPAPILLONS about her passing away. She had some very good friends here, as I can see. Oh my goodness, Bobbi!!! This is over the top gorgeous!! 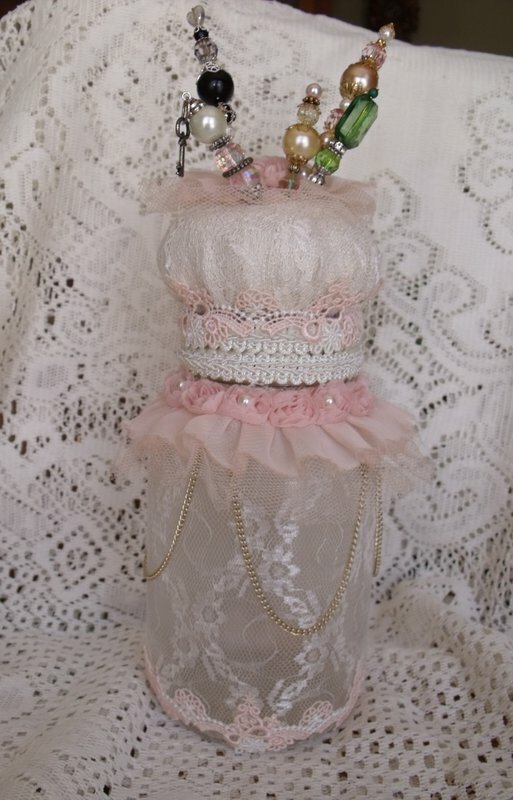 This is so pretty Bobbie, I love the lace on the bottle, so soft looking. gorgeous--what a beautiful job you did! Wow!!! Bobbi, this is gorgeous!